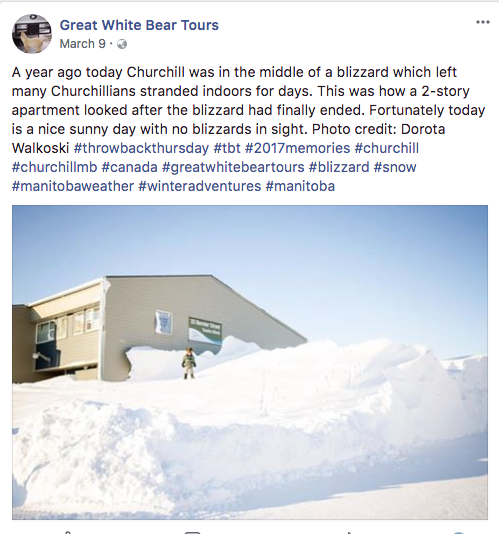 Great White Bear Tours is located in Churchill, in the state of Manitoba, Canada. Churchill is found at 58.7684° N, 94.1650° W (just south of the Arctic Circle). Churchill is located on the western coast of Hudson Bay, at the estuary of the Churchill River. The latitude of Great White Bear Tours is significant because it impacts the climate, and so, the plant and animal communities in the region. Being just south of the Arctic Circle it experiences a Continental Subarctic climate. Mean monthly temperatures are below zero for six to eight months and on average 50-90 days in a year are frost free. Winteres tend to be long and bitterly cold, while summers are short and mild. These climatic conditions are integral to providing the conditions suitable for polar bears, belugas and arctic foxes, etc. The latitudinal location also corresponds with the location of the Aurora Borealis. The Aurora Borealis (also known as the northern lights) is a display of coloured lights in the night sky. The shades of red, green, blue and violet occur above the magnetic pole and are the result of gas particles colliding. The Aurora Borealis is best viewed in locations which are not affected by light pollution in places that are latitudinal relatively close to the magnetic north pole. Churchill’s latitude and isolation make it an excellent site for viewing the Aurora Borealis. Bedrock and soils impact on the stability of the ground to build tourist infrastructure and buildings on, and the types of vegetation and fauna present. The location of the tourist site in relation to both the river and bay is significant for transportation purposes and the ecological communities associated with them (particularly sea ice in Hudson Bay and polar bear populations, and beluga whales in Churchill River). 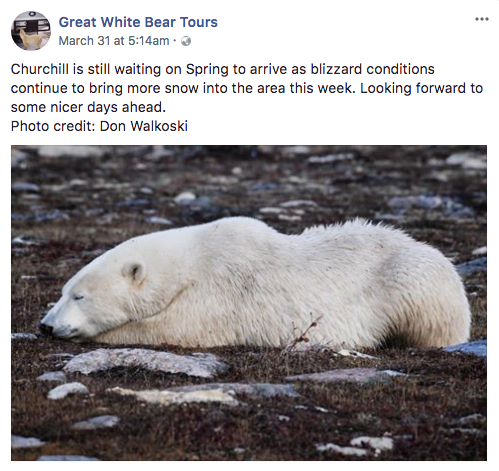 For the success of the operation Great White Bears Tours need to ensure that their tour locations correspond with the location of the polar bears and other animals. 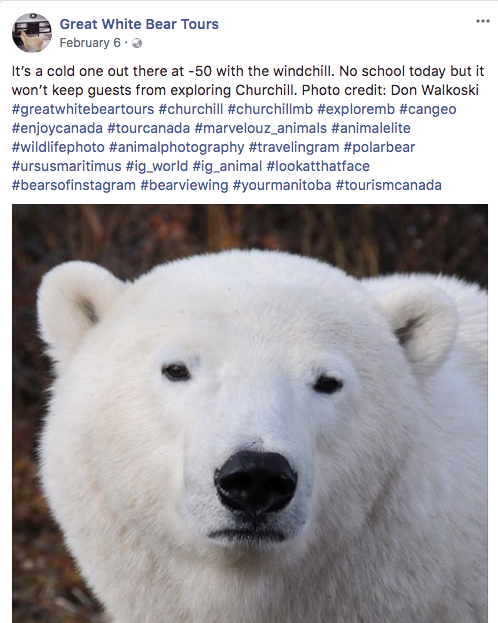 While the business is located in the town of Churchill they use Polar Rovers to ensure that visitors see the polar bears, arctic foxes, etc. 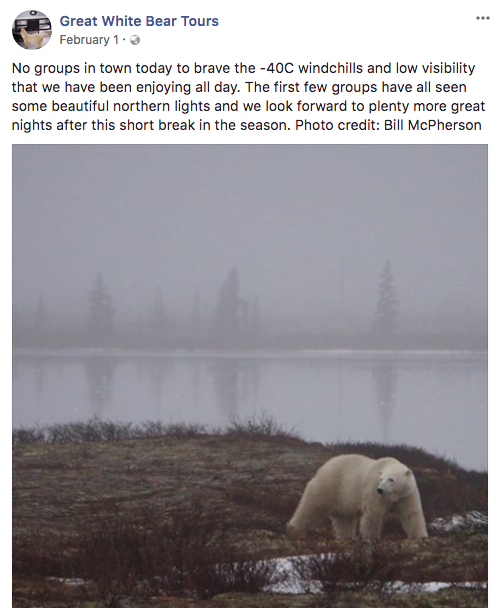 Tourists can choose to stay on the Polar Rovers overnight to increase the area that they can cover and the remoteness of the locations they are visiting to improve their likelihood of seeing the animals. Beluga whales migrate to the nearby Churchill River estuary in early July to give birth and then stay to feed on capelin and Lake Cisco fish. Churchill is isolated and far from nearby towns, as there are no paved roads directly connecting Churchill to its closest towns. The nearest large settlement in Thompson is 400 km away. Supplies need to be flown in, or brought in with specialised treaded vehicles pulling sleighs, which need to be guided in by snowmobiles. Canadian National Railroad Co. abandoned the rail line from Winnipeg to Churchill in the 1990s. Omnitrax purchased the rail line in 1997, but despite subsidies and government investment, following damage from widespread flooding the rail line ceased to operate in May 2017.